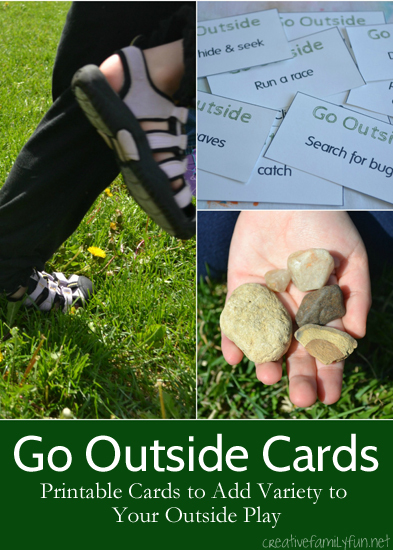 Back in the early days of this blog, my Go Outside Cards post was one of my most popular posts. It still has people stopping by daily.It was a simple idea to add a surprise element to your day. The premise was simple. 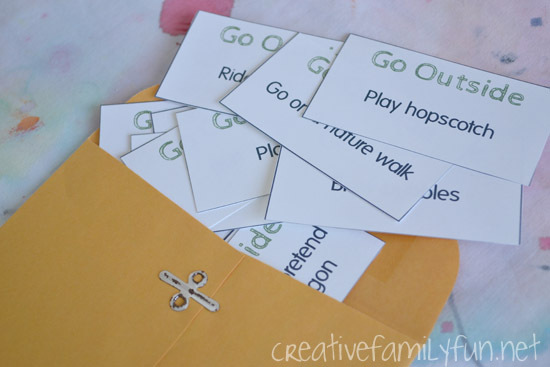 Write several outdoor activities on index cards, put them in an envelope, and have your kids choose one to kick-start their outdoor play. The ideas on the cards weren’t complicated and most did not require any prep time or special supplies. I’ve been wanting to update that post for a long time and now that spring is here, it seems like the perfect time. 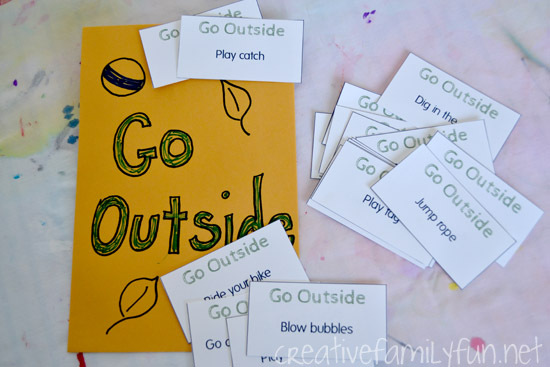 I came up with 25 fun outdoor activities and created a free printable for you. I’ve even included 5 blank cards so you can add your own fun ideas.All you need to do is print them out, cut, hide in an envelope, and go have fun! Include all 25 or just pick the ones that work for your family. I’ve got simple ideas such as play hopscotch, go on a nature walk, jump rope, search for bugs, and roll down a hill.I’ve included active play, nature play, and pretend play. It’s a fun boredom buster and a great excuse to just get outside and play. Click below to download and print your Go Outside! Cards. It is a pdf and designed to print on regular letter size paper. Print on card stock or laminate to make them more durable. As always, if you have difficulty downloading or printing, please let me know and I’ll get it fixed as soon as possible. Have fun and go outside and play! Planning Time: 15 minutes to print and prep your Go Outside! Cards. Prep time for activities varies. Most require minimal prep time. Time Needed: Varies. You should be able to find an activity to fit the time limit that you have. Notes: Keep your Go Outside! packet handy for last-minute family time. You’ll have a wealth of family activities at your fingertips.